Hello everyone! TGIF!! I feel like the 2 weeks since my last reveal have flown by. Not to worry though, there is still lots of time to play along with the sketches for May and link up for a chance to win an amazing prize! I just recently picked up this super fun paper pack by Jillibean Soup called Sightseeing Stew. I’m a sucker for travel packs as it is, but this one really hit it out of the park!! I also picked up the flash cards to go with the pack because they’re just that awesome too. I knew just the photos I wanted to play with to go with these papers for this reveal! I just love that the sequins picked up the “mist” and “sparkle” feel of the ocean water. The big square patterned paper is a bit bolder than I’d normally use so I love that the vellum tamed it down a bit. I also completely love that I had a few other embellishments I could add in from my stash that worked so nicely with the pack, including some other Jillibean Soup from another collection. I had so much fun swimming with the dolphins when we stayed at Isla Mujeres Palace in January of 2013. I think this layout, and the pictures, really captured that joy. 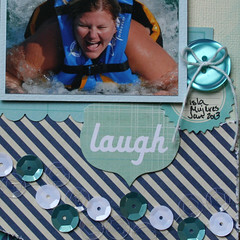 I hope you’ll pop on over to the ScrapMuch? blog and see what the rest of the team created this week, and then play along yourself! I can’t wait to see what you create! And if you’re in Canada, have a fantastic long weekend!! First I love the photos & the smile on your face. 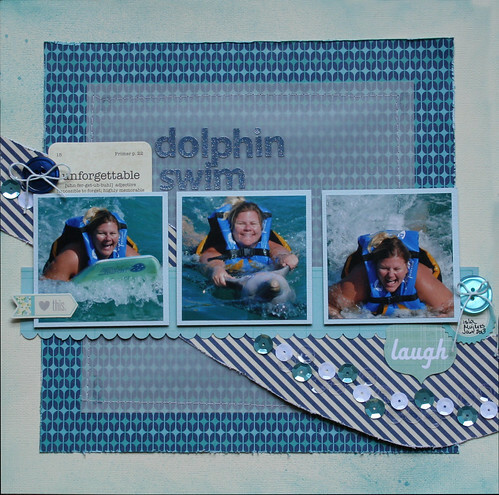 Such a fun this layout.. There’s great movement across the page and I also love the sequins. This page is sheer perfection, thank you for providing such incredible inspiration!